So down here in Texas, state pride is pretty big. I’d say as big as our state, but it is bigger than that. Texans just love it here. Even folks from other parts of the country, even the world, move or visit here and quickly start showing their Texas pride. Growing up (heck even to this day), I remember ‘arguments’ of sorts with my cousins (who lived in other states) about who lived in the best place. “My state is better than yours!” was a constant phrase belted from our mouths. Me, and my home state of Texas. I mean come on! Does your state have (Texas) shaped pasta that your Mom would always use to make homemade mac ‘n cheese? Or can you buy a waffle iron in the shape of your state? Or even a cookie cutter or cake pan? 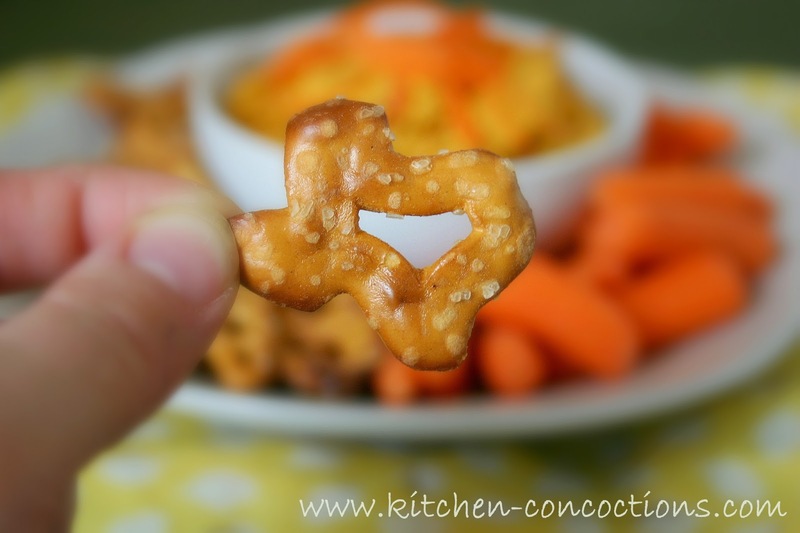 And seriously, snack time is so much better when I can dip Texas shaped pretzels into hummus. My favorite state AND snack in one! But no worries, if your state doesn’t have their own pretzels you can still enjoy this hummus with plain ole boring pretzel twists and rods. I guess, since this super healthy twist on an already healthy snack is super tasty, the shape and size of your dipper of choice, really doesn’t matter all that much. Just as long as you are inhaling this hummus. 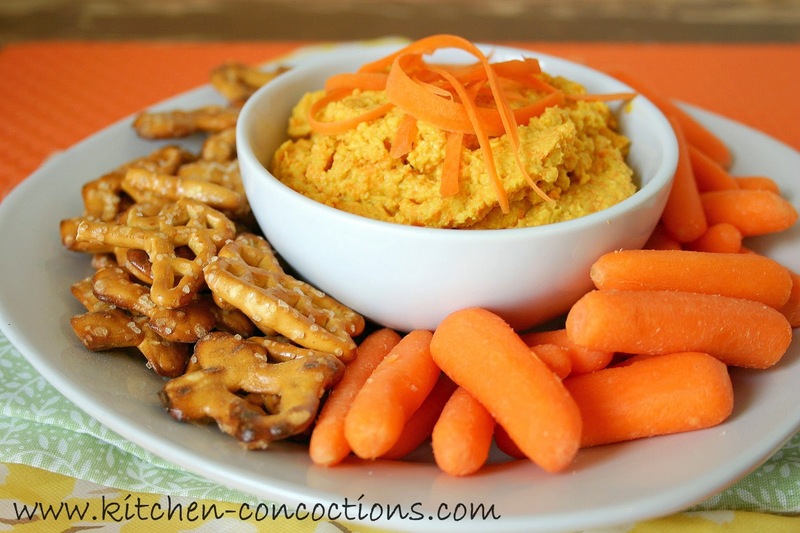 Hummus, packed (seriously packed) with carrots which lend it a sweet yet slightly earthy flavor. Yeah, I’m all for adding more veggies to my diet in every way possible, even if it means ‘sneaking’ them in (even if it is just for me). Place all the ingredients into a large food processor and pulse several times. 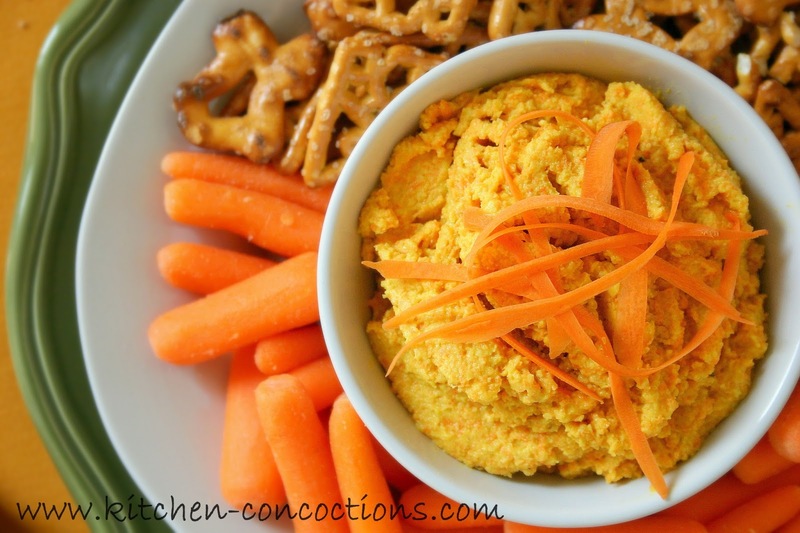 Continue to run food processor for about 2 minutes or until hummus is smooth and desired consistency. Serve as desired with veggies, pita chips or pretzels.